Can be used in most systems which do not require a protease free or enzyme free reagent. Ideal for making diluents, controls and calibrators/standards. Excellent solubility and ease of filtration. Applicable as a protein base in diagnostic reagents or where no proteolytic activity is essential. Reconstitutes easily into an optically clear and easily filtered solution. Suitable as a nutrient supplement in culture media. Works well with immunoassay systems where lipids are undesirable. Good for studies in binding and transport. Designed for a variety of bacterial and mammalian cell culture applications. 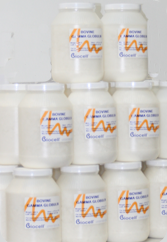 Used as a protein supplement in serum-free media for tissue culture. Promotes and sustains cell growth without toxic effects. Goes into solution rapidly to form a clear and easily filterable solution. Readily soluble in low saline concentrations or other buffers. Low optical densities at all wavelengths. Great as a diluent, calibrator or control. Useful in immunoassay functions including blocking and precipitation. Ideal for preparation of diluents, calibrators and controls where human base is required. Works well with immunoassay systems when a “0” value is unattainable due to non-specific binding. Suitable for use in immunoassay systems as both a diluent and blocking agent. For research and in-vitro diagnostic use. Well suited for a variety of bacterial and mammalian cell culture applications. Excellent for preparation of diluents, calibrators and controls. Low Vitamin B12 and folate values. We use your kit to screen. Great for preparation of diluents, calibrators and controls where a human base is required. Works will with immunoassay systems when a “0” value is unattainable due to non-specific binding. Broadest range of solutions ready for your use. Great for preparation of diluents, calibrators and controls where a human base is preferred. Ready for us in immunoassay systems as both a diluents and blocking agent. 0.2µ membrane filtered, no preservatives added. A purified preparation from Cohn’s Fraction II and III. Very useful in numerous immunoassay functions including blocking and precipitation.